PepsiCo's new chief executive inherits a company in good shape, thanks in large to a healthier food and drinks strategy. 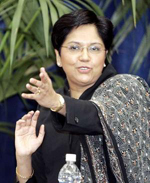 Indra Nooyi's appointment as CEO of PepsiCo sees the Indian-born, Yale-educated executive take control of a company at the top of its game. And she is inheriting a legacy she helped to create. As PepsiCo's chief financial officer, Nooyi worked closely with previous CEO Steve Reinemund on crucial decisions that have paid big dividends - the most obvious last December, when the company's market capitalisation (the total value of its shares) reached $98.4 billion, overtaking arch-rival Coca-Cola (at $97.9 billion) for the first time in 112 years. PepsiCo has moved ahead of Coca-Cola thanks to less reliance on colas and fizzy drinks than its rival. PepsiCo is very much a diversified snacks and drinks business, as opposed to the beverages-dominated approach of Coca-Cola. Although both companies have been striving to offer healthier products, Coca-Cola remains more dependent on its carbonated drinks heritage, accounting for 80% of sales. According to Beverage Digest magazine, bottled water, sports drinks and iced tea were the three fastest growing drinks categories in the US in 2005, and PepsiCo was ahead of Coca-Cola in all three. The turning point for PepsiCo was the late 1990s, when it sold off its restaurant business - comprising KFC, Taco Bell and Pizza Hut - and acquired the best-selling juice brand Tropicana and food and drinks company Quaker Oats, which Coca-Cola itself had attempted to buy. The acquisition of Quaker in 2000, for $2 billion less than Coca-Cola's bid, bought PepsiCo the Gatorade sports drink and Quaker's cereal brands, which plugged the company into the fast-growing healthy food sector. PepsiCo's shares are now trading 70% higher than six years ago, in contrast with Coca-Cola's, which are trading 30% lower. Although Reinemund, who has retired, will be remembered as the CEO who oversaw these crucial step-changing decisions, he credits Nooyi with co-authoring the strategic blueprint that underpinned them. Given her key role in plotting its direction, few expect Nooyi to change tack now she is in charge. Improving Pepsi's health focus and building on its lead over Coca-Cola are key tasks. Her Indian heritage will also play well in her home country, where Pepsi and Coca-Cola have both been banned in six states after a pesticide contamination scare. After a long search for a successor to the retiring Doug Daft, Coca-Cola turned to a veteran insider when it pulled the former CEO of Coca-Cola Beverages, 60-year-old Neville Isdell, out of retirement in 2004 to become overall CEO. Investors were nervy about the appointment, not least because several high-profile external candidates, including Jim Kilts of Gillette, turned the job down. Famous for addressing a company sales meeting in the 1980s dressed in battle fatigues and smashing a bottle of Pepsi against the wall, Isdell is a no-nonsense fighter - qualities he will need to pull the former darling of Wall Street out of one of the most difficult periods in its history. Although Isdell has overseen rapid expansion and innovation and a move into healthier sectors, Coca-Cola still remains more reliant on carbonated drinks than its rival. However, he has been praised for reshuffling senior management and giving the company a sense of unity and direction, encapsulated in the so-called 'Manifesto for Growth'. His key challenge will be to continue investing and diversifying into healthier products, without undermining the 'legend' of the company's core brand.